According to this recent TED talk given by Jonathan Drori, life really is all about the birds and the bees, with a lot of help from flowers. Flowering plants, of which there are at least a quarter of a million known species, have evolved to develop fascinating traits in order to reproduce. Flowers are difficult to produce and the endeavor requires a lot of energy and resources. So why do they bother? Drori says that, like so many other things in the world, it all boils down to sexual reproduction. Plants can reproduce by themselves through self-pollination, but sexual reproduction is the means by which they spread their genes to mix with other plants in order to keep up with evolution and adapt to environmental niches. Sexual reproduction requires the transference of pollen, a powder-like substance that contains male gametes, to other plants. Amazingly, there are as many kinds of pollen as there are flowering plants. 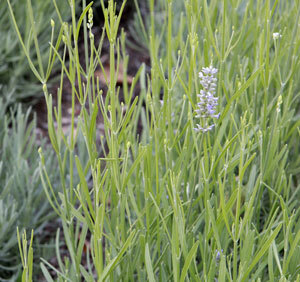 Many types of plants, like the grasses and trees that produce hay fever, reproduce through wind-pollination. This process is inefficient because it requires plants to release massive amounts of pollen to get the job done. A more effective method is through a symbiotic process by which flowering plants transfer pollen to insects and birds in exchange for nectar. These pollinators in turn carry the pollen directly to other plants. Symbiosis has led to beautiful adaptations like the Hummingbird Hawk-moth (Macroglossum stellatarum), which looks remarkably like a hummingbird while feeding on flowers. It has also produced unique physical traits in flowering plants that aid them in attracting insects and birds to “do their bidding.” These tools of seduction include “landing strips,” markings on petals that guide an insect to a flower, and the anthers on a lily, which are cleverly designed to flip up and knock the insect on its back, covering it in pollen. Among the 20,000 known species of the orchid, there are a variety of unique traits. One type of orchid appears to have jaw-like petals that cover an insect in pollen as it crawls through them to get to the flower’s precious nectar. Another, the Madagascar Star Orchid, or “Darwin’s Orchid” (Angraecum sesquipedale), has a long nectar tube only accessible by an insect with an equally long proboscis. Darwin himself studied the flower and notably predicted that an insect capable of accessing this tube must have coevolved with the species. Watch the video and you will see the one with just the right proboscis for the job. Since nectar is such a valuable commodity, some species of orchids have developed traits to help them trick pollinators into thinking they have it when they actually do not. They are able to lure insects in because they look like species that do have nectar. Other species of orchids use different methods of deception by exhibiting characteristics that are particularly attractive to a certain type of pollinator, like a pair of black dots that to a male insect look like two female insects resting on a flower, or a glossy metallic surface reminiscent of a beetle’s shell. Still others in part or whole resemble the form of an insect, like an orchid with a petal reminiscent of a bee. Bees flying by catch sight of the petal and, thinking it’s another bee, try to fight it, knocking it about and picking up the flower’s pollen in the process. In an especially devious turn, this same orchid does not offer nectar but strongly resembles another species that does. Scent is another source of attraction. Ylang-ylang (Cananga odorata), a rather unremarkable looking plant, has an incredibly enticing smell used in many perfumes that is irresistible to insects. A very different species, the Dead horse arum (Helicodiceros muscivorus), is a lily that has evolved to look like carrion. Though it smells horrible and has no food to offer, blow-flies love it and lay their eggs inside it. Other species of flowering plants use heat to attract insects. The Arum maculatum is a type of lily that can heat up to 15 degrees above ambient temperature. Flies are drawn to the heat and become trapped inside the flower. Once inside they drink the nectar and become covered in pollen. The flower’s bristles eventually wilt and release the flies. Philodendron selloum flowers for two days during which it maintains a constant temperature of 115 degrees with an internal thermo-regulation mechanism. It fuels this process by metabolizing fat, like mammals, rather than starch. Some beetles mate at exactly that temperature and will get inside the flower to do so, becoming covered in pollen in the process. Color also plays an important role. In tropical regions, bird and butterflies pollinate flowers that are red because, like humans, they see the red, blue, green spectrum and are attracted to the color. Insects, however, see the green, blue, ultraviolet spectrum. Drori conducted a fascinating experiment in order to see what attracts insects to certain flowers. He photographed a Helianthemum, a small yellow flower, and compared several images of it. One image shows the flower in natural light, the way humans see it, while another shows it with the red removed, the color insects cannot see. Then Drori used an ultraviolet filter and a long exposure to produce an image depicting the flower in stark contrast to the background, looking similar to a bull’s eye. One could imagine it would be difficult for a bee to miss it. Not all yellow flowers have this property and, for comparison’s sake, Drori also shows an image of a flower that blends into the background. He notes that the flower could be used as the basis of a sunscreen, which works similarly by absorbing ultraviolet light. 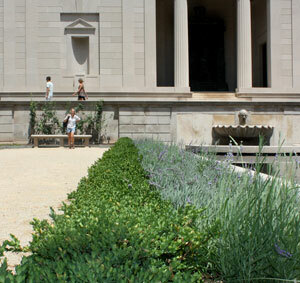 This guest post is by Shannon Leahy, ASLA 2011 Summer Intern. 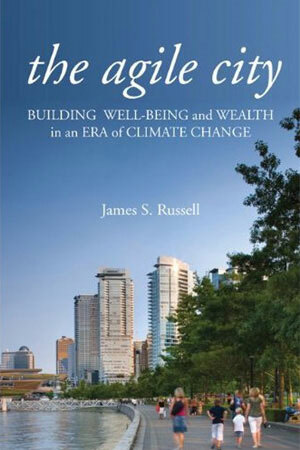 In The Agile City: Building Well-being and Wealth in an Era of Climate Change, James S. Russell, architecture columnist for Bloomberg News, argues against taking a mainstream, business-as-usual-approach to addressing climate change in the U.S. The current global warming debate focuses on harnessing “alternative energies” strategies, like hydrogen-powered cars and biofuels, clean coal, and reinvented nuclear that Russell calls speculative technologies that may not prove viable, require significant investments and have large environmental effects. He proposes a different approach, one that could have manifold benefits and achieve faster and more effective results than making massive alternative-energy investments that amount to tax gimmicks. There is just one sticking point: they would require the U.S. to move away from the “normalcy” of overconsumption. Russell’s solution for adapting to climate change and achieving carbon neutrality is based on proven efficiency measures and some renewable energy. He targets buildings and transportation, the two largest sources of U.S. greenhouse gas emissions that respectively account for 40 percent and 28 percent of emissions. Addressing them simultaneously with denser, energy conservation-oriented and transit-centered development, Russell says, could result in more agile cities, those that are able to adapt to constant change, simultaneously reducing greenhouse gas emissions while coping with climate-change effects. The agile city would evolve out of innovative policies that “deploy regulations straightforwardly, balancing them with incentives. Rules will reward performance (energy, water, and emissions saved) rather than prescribing what lightbulbs we’ll use and what cars we’ll drive.” These regulations will also boost well-being and produce economic values that gross domestic product (GDP) fails to measure, like increased real estate values from repaired natural systems and health care costs saved from reduced rates of cancer. Rather than taking drastic measures like wiping out suburbia and converting it to a traditional city or inventing the perfect “supercar,” these regulations would engage sensible and relatively low-tech strategies to retrofit, repurpose, and reinvent the current landscape of megaburbs – a viral form of “suburbia on steroids” that requires high energy and resource use. New development patterns would create “mutt-like” urban hybrids with multifamily and mixed-use buildings clustered along transit corridors. Buildings could harvest natural sources of sun, shade, fresh air, daylight and cooling with updates to traditional climate-responsive technologies rather than requiring expensive and complex mechanical systems. Transit corridors could offer “prosaic auto alternatives that a great number of people can use,” like bike lanes, rationalized bus routes, and rail systems. As communities become denser and shift away from automobile dependence, the leftover asphalt acreage from roads and parking lots could convert to space for natural systems like suburban forests and wetland restoration. Russell believes the U.S. can craft the policies and develop a growth machine that supports these endeavors with fairly straightforward regulatory measures, but they will require a significant shift in cultural attitudes. The current growth machine creates dysfunctional sprawl through the way real estate is financed, housing subsidies are distributed, transportation is provided, and resources like water are obtained, distributed, and disposed of in communities. This system, once supposedly intended to provide affordable housing, now forces people to move continuously further out from urban centers, resulting in a need for ever-increasing taxes and resource consumption. While new regulations could spur new development patterns, Americans, who have traditionally equated private property ownership with wealth and independence and continue to buy into the current system, would have to let go of old habits. Can megaburbs embrace big-city density and diversity, so long anathema in suburbs? Russell thinks the government can encourage people to embrace new attitudes toward ownership and community by taking a harder line on land use policy, construction techniques, and driving. Rather than allowing private property rights to trump the greater good of the public, Russell believes government at all scales must stop basing growth on the heedless accumulation of individual investments and try to develop a land ethos based on community values. He wants to encourage Americans to adopt new ideas about ownership that would support strategies by which communities act in tandem to protect the land they share, like land trusts and mitigation banks, especially in places that are at the greatest risk of natural disasters. He also wants to stop promoting tax benefits and subsidies that encourage funding for a limited menu of obsolete buildings and only benefit speculators and wealthy homeowners. He says to forego current incentives, like forgiving capital gains taxes on the sale of homes, and introducing new ones that would discourage people from treating their house as “investment vehicles” rather than homes. For instance, he suggests only allowing interest deductions on home-equity loans when loan proceeds go to fixing up houses, especially to make them more energy efficient. He also wants to promote tax benefits and direct subsidies that encourage builder and designer innovation and reward homes that are smaller, more efficient, and shore up existing communities and repair environmental damage. As far as transportation goes, Russell says it is imperative to put public transportation infrastructure in place first to get people out of their cars. In order to finance this effort, he wants to banish the billion dollar beltways and divert the funding from taxes that currently subsidize roads, cars, and gas to support bus and rail systems. He suggests a 25 cent rise in gas tax, called a “mobility fee” to raise $305 billion over the next 10 years for new public transportation infrastructure. To provide further disincentive for driving, he also suggests a series of “pay as you go” fees that would provide compensation for automobile-induced pollution. These fees would include raised pump fees, additional tolls, and congestion fees. He believes the new growth machine would drive a green economy that could replace the U.S.’s unstable growth model built on short-term economic cycles and the consumption of finite resources. 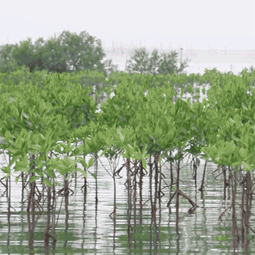 It would respect the limits of growth the current model wants to ignore, thereby avoiding resource shortages and the destruction of natural systems that can no longer support human endeavors. It would also support a different type of growth, one that recognizes that faster-growing cities are not necessarily wealthier: “countries can grow in wealth without growing in population and, by implication, without increasing consumption; slow growth with careful stewardship of resources could pay off.” Cities with local food economies, for example, benefit from high-quality, organic, locally-produced food that thrives in the uniqueness of a given locale’s climate and soils. This food is exchanged through personal transactions that depend less heavily on transportation energy and unsustainable manufacturing practices. Plus, locally grown crops can sustain rural places trying to compete in the hemispheric, commodity-agriculture economy. 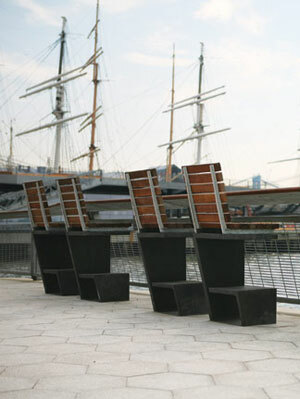 The two block esplanade, designed by landscape architect Ken Smith, ASLA, and SHoP Architects, runs from Pier 11 at Wall Street to Pier 15 at South Street Seaport. This section is only a preview: It will ultimately head up to Pier 35, north of the Manhattan Bridge, making its total length about twice as long as the High Line Park’s current one-mile length. 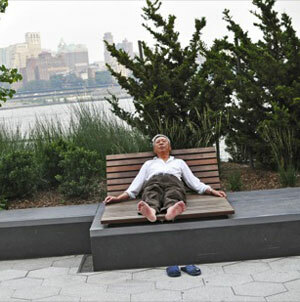 The Architect’s Newspaper says the park is part of a broader $165 million project by the NYC government to connect the promenades and bike paths of the west side to the “heavily trafficked spaghetti” of the east (see earlier post), and also link up with the bold new Pier 35 “eco-park” also designed by SHoP Architects. Just to note: Unfortunately, all those railings and bench slats are made of a rainforest hardwood called ipe, which can’t be harvested sustainably given they grow very sparsely. 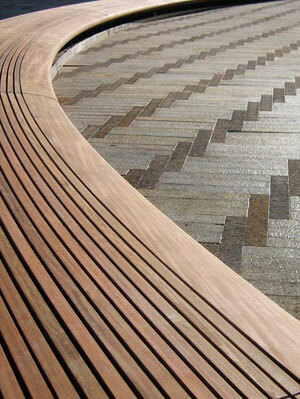 According to Wikipedia, New York City’s parks department has used ipe in its riverfront parks since the late 1960s, largely because, as a natural hardwood, it lasts up 25 years. There are adverse effects though: “Large areas of forest must be searched and cut down to create paths to harvest and fill orders for boardwalks and, to a lesser extent, homeowner decks.” While FSC-certified ipe is now available, there are far easier ways to harvest more sustainable domestic natural hardwoods like black locust. Ken Smith, who’s work often includes vibrant pop-art elements, uses “multi-hued grey hexagon pavers riffing on a highly pixilated photo of the water.” There’s also a series of planting beds made up entirely of native coastal plants. 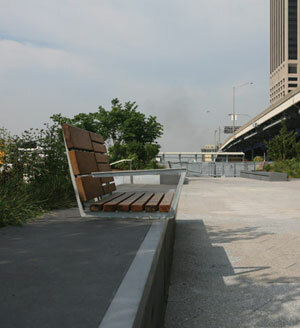 He told The Architect’s Newspaper: “There’s an emphasis on native plants, while the modulated seating and dunes create a meandering walkway.” The overall effect is several berms that function as “seat walls” made of sculpted concrete, but are also edged in stainless steel to enable skateboards to use and not destroy. Additional features include “Get-Downs,” which are stairways that look like widened bleachers, and enable visitors to move towards the river itself and splash around (if the water toxicity levels are low that day). Final phases running from Broad Street to Old Slip and from Pike and Allen Streets up to Pier 35 will be completed by 2013. Learn more about the new esplanade. Also, check out a new Google Sketchup animation that explores how to use transportation infrastructure to create public spaces. 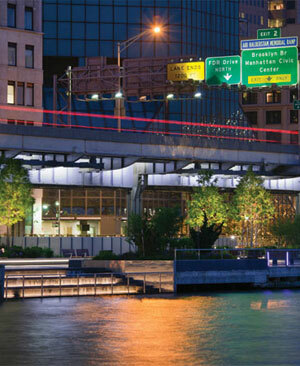 Image credits: (1) East River Esplanade. Peter Mauss / ESTO, (2) Bar stools. AN/Stoelker, (3) Bar stools. Maria Lokke / The New Yorker, (4) Edged Berm. 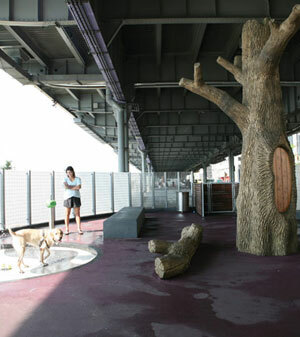 AN/Stoelker, (5) Dog park. AN/Stoelker, (6) Chaise Lounge. Maria Lokke / The New Yorker. The prevalence of low-density, automobile-dependent communities has resulted in unsustainable lifestyles that increasingly threaten human health and well-being. 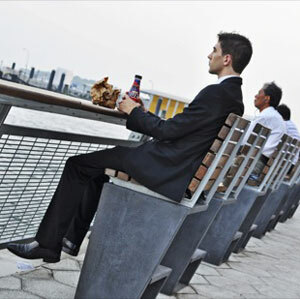 In addition to inflating housing and transportation costs and increasing carbon emissions, disconnected communities reliant on cars create sedentary lifestyles. The lack of access to environments that encourage daily exercise, provide clean air and water, and offer affordable services and nutritious food has meant growing epidemics of depression, obesity, diabetes, asthma, and heart disease. 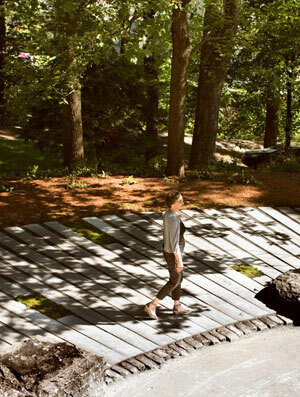 Working with landscape architects, communities can promote human health and well-being by encouraging the development of environments that offer rich social, economic, and environmental benefits. Healthy, livable communities all improve the welfare and well-being of people by expanding the range of affordable transportation, employment, and housing choices through “Live, Work, Play” developments; incorporating physical activity into components of daily life; preserving and enhancing valuable natural resources; providing access to affordable, nutritious, and locally produced foods distributed for less cost; and creating a unique sense of community and place. 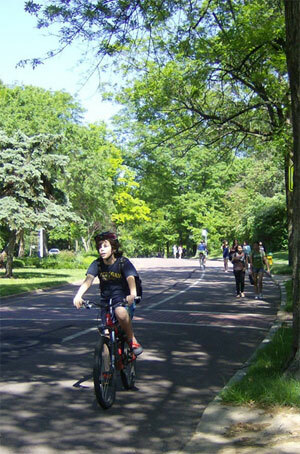 Landscape architects help communities maximize opportunities for daily exercise like walking and biking. 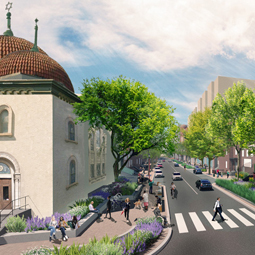 Landscape architects encourage communities to move towards compact, transit-oriented land-uses by designing Complete Streets and other transportation networks that connect mixed-use developments, neighborhood schools, and a range of affordable housing choices. 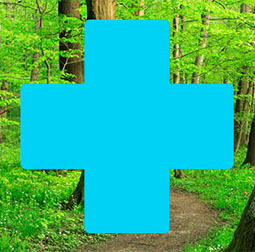 They assist communities in developing healthy green buildings and open spaces that promote efficient water and energy use and provide substantial amounts of vegetation to clean air and cool temperatures. In doing so, these communities can avoid the expensive health epidemics associated with automobile dependence, sedentary lifestyles, along with the high costs to the environment brought by dysfunctional patterns of living. 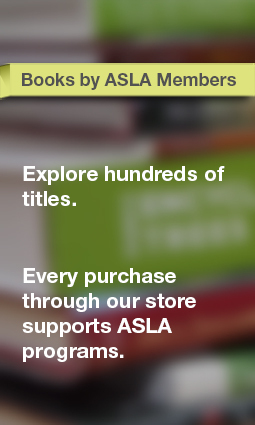 Go to Healthy and Livable Communities and check out other guides in the series. 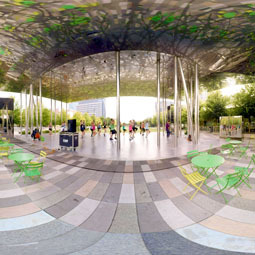 Image credit: ASLA 2010 Professional Honor Award. 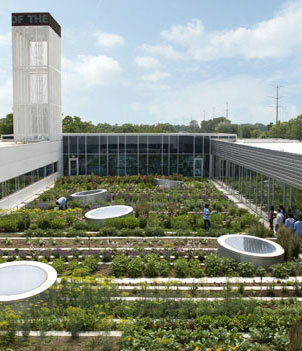 Rooftop Haven for Urban Agriculture, Gary Comer Youth Center, Chicago, Illinois. Hoerr Schaudt Landscape Architects. Architype Review, a Web site created by designers for designers, focuses in on a different building type each month. 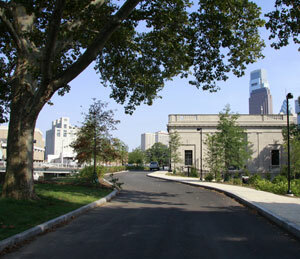 Past issues have focused on train stations, museums, hotels, and schools. Within each type, the site tries to “honor those projects that are challenging the limits and redefining the norms.” Now, Architype has zoomed in on landscape architecture, selecting a set of 16 landscape projects from around the world, along with a slideshow of “iconic landscape architecture.” There are also book reviews. 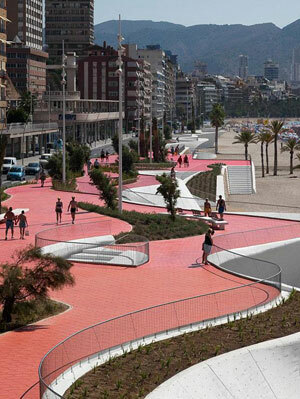 Seafront of Benidorm, Barcelona, Spain: OAB, a landscape architecture firm, designed a new promenade to be a “place with a life of its own.” Its organic lines, “a reminder of natural wave forms,” create an “ensemble of honeycombed surfaces that juggle light and shadow, a series of convexities and concavities that gradually construct a set of platforms and levels that provide areas for play, meeting, leisure or contemplation.” The site is also set-up to handle rainwater runoff. 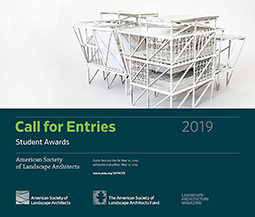 See the landscape architecture issue. 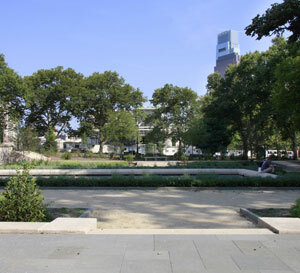 OLIN, a leading landscape architecture and urban design firm, has rejuvenated the garden landscape of the jewel-box Rodin Museum, which is found on the Benjamin Franklin Parkway in Philadelphia. 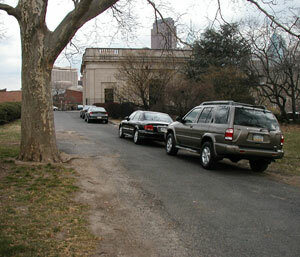 The $5.5 million site refresh was designed to “enhance and amplify” the original 1929 designs of the garden by French architects Paul Cret and Jacques Gréber, but is also part of a bigger project to “re-imagine and renew” the entire Benjamin Franklin Parkway as the central “artery” for the arts in the city, and connect with the Philadelphia Museum of Art master plan. 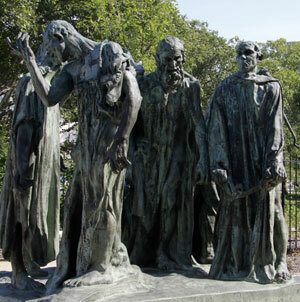 One highlight of the re-opened outdoor museum: the return of the great French sculptor’s The Burghers of Calais to the outdoors after more than 50 years of being locked inside. 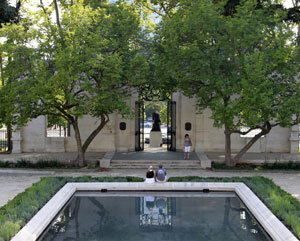 The sculpture was moved from within the sculpture gallery to a new spot in the east garden. 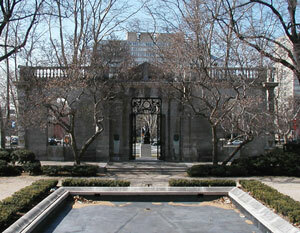 In addition, two life-sized bronzes, The Age of Bronze, and Eve are now back in the museum’s facade. Adam and The Shade will find new homes in the garden. 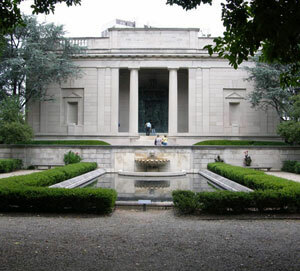 These five works, along with The Thinker at the Parkway entrance and The Gates of Hell at the doorway to the museum, means the site once again serves as a elegant frame for Rodin’s figures. Here are a few close-ups of the new plantings. Outside the garden, lawns were restored, new trees and groundcover were planted, along wth new pedestrian circulation routes (including stairs, curbs, pathways, and a drive to improve accessibility). Outer areas also feature the native plantings Cret and Gréber used, under a canopy of trees. Still, more work needs to be done. While 80 years of grime were removed from the exterior limestone, the indoor parts of the sculpture gallery will close in September for a three-month renovation, which means some more Rodins may also move outside. 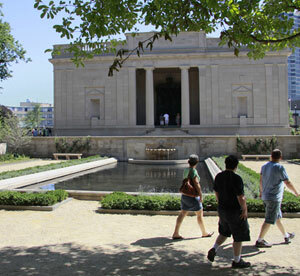 The Rodin Museum, a must-see in Philly, is next to the Barnes Museum and near the Philadelphia Museum of Art. Working with Edward S. Barnard, author of New York City Trees, Ken Chaya, a graphic designer and artist, has spent more than two years creating Central Park Entire, an illustrated, comprehensive tree and trail map of Central Park available either as a poster or fold-out walking map. 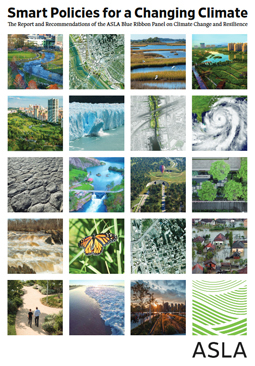 This guide to the natural history of the one of the world’s greatest parks, which covers 85 percent of the vegetation in the 843-acre park, painstakingly plots more than 19,600 trees, using a set of icons to indicate the 170 different tree species. In addition, the map explores the visionary landscape architecture created by Frederick Law Olmsted and Calvert Vaux, including major park design elements such as lawns, lakes, ponds, waterways, rocks, trails, and footpaths. The architecture within the park, including buildings, bridges, archways, monuments and statues are also detailed, along with the park’s recreational areas. In 2008, Barnard asked Chaya to design a map he was working on with Neil Calvanese, VP of Operations at the Central Park Conservancy. The end product: “the most detailed map of any urban park in the world.” Chaya adds that the map was designed to further illuminate “the masterful design of Central Park’s creators, Frederick Law Olmsted and Calvert Vaux,” which is now “more evident today than it was in the 1870s when the Park was just completed.” In fact, the map is meant to celebrate the enduring vision of the park’s designers. 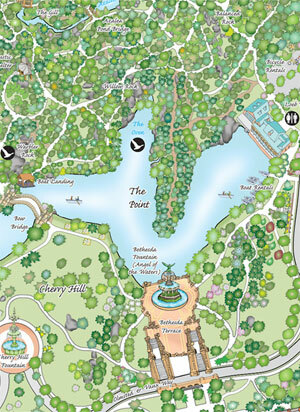 The actual map is incredibly rich in detail, and any lover of Central Park could spend many hours with this. However, even for the more casual visitor to Central Park (and there are more than 37 million each year), the map’s tree icons can be used at any point in the park to identify the species of any tree. The only challenge: while many species have easily recognizable icons, some are somewhat similar, making identification more difficult. For example, the icons for the different cedars (northern white and eastern red) are nearly identical at tiny map scale. Still, this map enables some potentially fun activities and could help kick-start a walking arboreal bioblitz: Try to identify and count as many trees as possible while walking, or try to find the sole peach tree, or the six instances of persimmon, or one of our favorites, the Chinese scholartree. The duo spent more than $40,000 of their own money to design and publish the maps. Neither the city nor the conservancy provided any money, but some proceeds from the maps go back to the conservancy. They just hope to break even on the project. Let’s hope their efforts prove to be just the first in a slew of projects by dedicated naturalists around the world aimed at unveiling the rich biodiversity found within urban parks. Learn more about this amazing project, see a slideshow of Chaya and Barnard in Central Park, and purchase the poster ($35) or fold-out walking map ($12.95). As Congress wraps up its work on a debt ceiling deal that will avert a world-wide financial catastrophe, another crisis is looming down the road – literally. In less than 60 days, our nation’s surface transportation law will expire on September 30th, leaving the country’s highways, roads, streets, bridges and other infrastructure vulnerable. Today, our infrastructure is crumbling and in dire need of repair, congestion is clogging our transportation arteries, impeding commerce and economic development, and families are incurring major costs to travel to and from daily destinations. Congress must take action to pass a comprehensive transportation bill that will not only repair our current infrastructure and better expedite the movement of goods and services but also meet the current demands of American households. More importantly, individual households are feeling the economic pinch from the lack of a comprehensive transportation policy that fits the needs of today’s American family. Currently, many Americans are forced to take costly automobile trips for all their daily activities, including routine activities less than one mile from home. Schoolchildren cannot safely walk or bicycle to and from school and instead must rely on lengthy school bus trips that many school districts can no longer afford. Now, more than ever, Americans are clamoring to get out of their cars and have more transportation options than the car-centric approach first envisioned and deployed in the 1950s is providing. Recent studies have shown that an increased number of communities want nearby bicycle and pedestrian paths not only for recreational opportunities, but also to provide accessible networks to transit, shopping, school, work, and other daily routines. Not only will this save individuals and families thousands of dollars in transportation costs each year, it will also increase the value of their homes and other nearby real estate, and attract economic development. 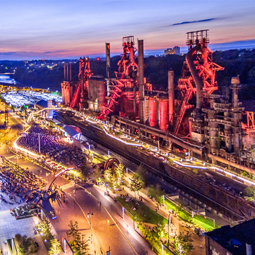 The U.S. Conference of Mayors recently surveyed its members about transportation infrastructure priorities, revealing that 75 percent of the polled mayors would support an increase in the gas tax if a greater share of the funding were invested in bicycle and pedestrian projects. These mayors went on to disclose that the lack of funding for bicycle and pedestrian projects was the biggest challenge to using transportation as part of their communities’ broader strategies to reduce congestion, improve livability, and increase economic competitiveness. Further, with the nation’s unemployment rate still hovering at nine percent, the impact of bicycle and pedestrian projects on job creation must be underscored. According to a recent Political Economy Research Institute study, bicycle and pedestrian projects create about 11.4 jobs for every one million dollars spent compared to 7.8 jobs created through road projects. The federal Transportation Enhancements (TE) program, first established in 1992 as part of the surface transportation law known as ISTEA, is the major source of dedicated federal funding to create bicycle and pedestrian projects. Given the needs of today’s communities, a robust TE program must be a critical component of any comprehensive surface transportation bill. Since its inception, the TE program has provided communities across the country with dedicated funding to design and construct bicycle and pedestrian projects. But clearly more is needed. The TE program is oversubscribed in many states, with requests about three times the available funds. Moreover, the Alliance for Bicycling and Walking reported that bicycling and walking make up 12 percent of all trips made in the United States, but receive less than 2 percent of federal funding. Recently, both the House and Senate unveiled blueprints for a new transportation policy. House Transportation and Infrastructure Chairman John Mica’s (FL) proposal is a six-year bill with a 35 percent across-the-board cut to existing transportation programs and the elimination of dedicated funding for bicycle and pedestrian programs, including the successful Transportation Enhancement program. Senate Environment and Public Works Chair Barbara Boxer (CA) released an outline of her bipartisan Moving Ahead for Progress in the 21st Century (MAP-21), a two-year reauthorization that would consolidate several core transportation programs, leaving the fate of TE unclear. When Congress returns from its recess in September, it must immediately return to “crisis mode” and focus its attention on crafting a well-balanced surface transportation policy that can repair our nation’s crumbling infrastructure and meet the present-day needs of the citizenry, all while spurring economic development and creating much-needed jobs. A final bill must include policies and programs that promote the efficient movement of cars and other motor vehicles, invest in transit, and strengthen our bicycle and pedestrian networks. Continuing the Transportation Enhancements program will go a long way in achieving these and other national transportation goals. 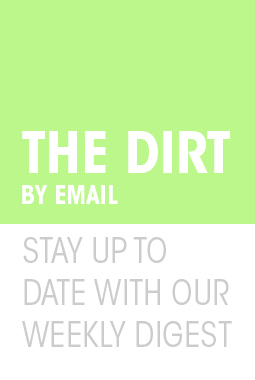 Now is the time to contact your legislators to urge them to support the Transportation Enhancements program in the next reauthorization of the surface transportation bill. 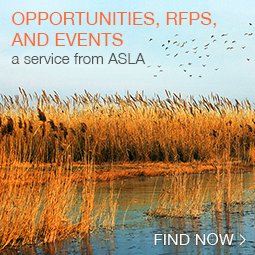 This guest post is by Roxanne Blackwell, Esq., Federal Government Affairs Manager, American Society of Landscape Architects (ASLA).